DENVER — This week, the Denver Fire Department dispatch communications begun encrypting its radio channels. The department is following the move dozens of agencies across Colorado have already taken to restrict radio traffic as a safety and privacy precaution. The Aurora Police Department has been encrypting its radio traffic for about three years. For Harry Glidden, a division chief for APD’s policy compliance and professional standards, the move is all about public safety. “It’s just safer for us to have our radio system encrypted,” Glidden said. Whereas before listeners had to own specific radio equipment to tune in to certain channels, these days most emergency dispatch communications are streamed online for anyone with access to the internet. Glidden says that has put the power in the hands of suspects to listen in on police communications to try to predict their moves. “There had been several instances prior to our encryption of the radio system where we had gone out and people were listening to us live on the radio,” he said. In one instance, Glidden said a car theft suspect used an app on his phone to listen in as officers pursued him. “We were blocks away from him and he heard that we were on our way to him and he just started taking off and driving crazily,” he said. That dangerous driving put police officers and the public at risk. “The Planned Parenthood shooter was listening to the police real time,” Glidden said. Aurora decided to make the move to encrypted frequencies as it upgraded its radio systems. Beyond protecting communications between officers, for APD it’s a matter of privacy. Many times officers or dispatch communicators will relay personal information about suspects, victims, callers or witnesses to one another over the radio. Some of that information might be considered HIPPA protected patient information and Glidden says it’s important to keep it out of the public reach. “We want to protect their rights and their privacy as much as we can,” Glidden said. Glidden likened it to redacting personal information out of police records when news organizations or the public files an open records request. So far, Aurora Police say they haven’t gotten much negative feedback about the encryption and they do believe it is making their officers safer. The Denver Police Department is also moving toward encryption as it updates its radio systems. Chief Paul Pazen says he came to the decision to encrypt radio communications after holding several stakeholder meetings and speaking with his staff. “We recognized that there were some issues with community safety information being broadcast over our radio system,” Pazen said. Pazen, too, says he has had several incidents where suspects were listening to police radio traffic that created an additional safety concern. “Ultimately it’s a balance between the community safety issues and transparency and we think that we came up with the best solution,” Pazen said. Denver Police and other agencies already have some encrypted channels for their tactical units. However, Pazen says those channels are not enough to alleviate the privacy concerns. “That’s great for officer safety but nothing stops them from addressing and publicly broadcasting victim, witness and suspect sensitive information, that’s why you have to look at this holistically to identity what are the best solutions,” he said. DPD is currently working with its legal department to come up with a consent agreement for media outlets to be able to listen to encrypted channels. “We’re not just flipping a switch and going dark and telling the media to follow us on social media,” Pazen said. 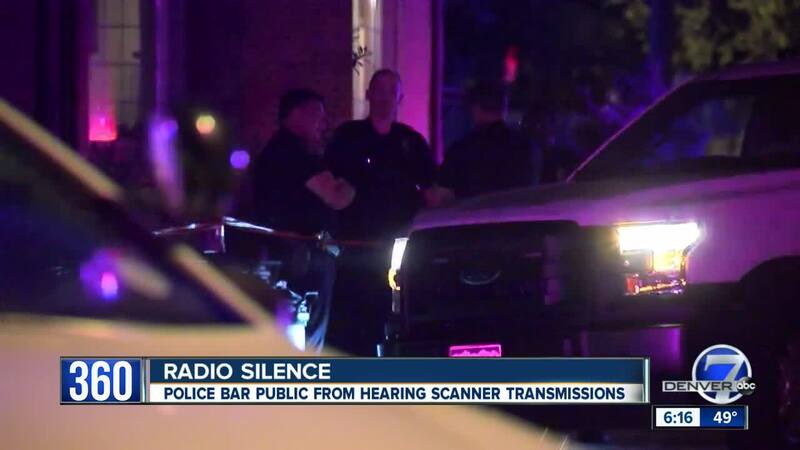 However, the radios will cost newsrooms money and similar attempts by the Longmont Police Department did not go over well with local publications. The editor of the Longmont Times-Call refused to sign the agreement because he believed it would restrict their reporting. The two sides eventually came to a verbal agreement. Smaller agencies like the Steamboat Springs Police Department are choosing not to encrypt their communications yet. “We have not even started a conversation about encryption mainly because of the technology,” said Chief Cory Christensen. His smaller department has not experienced the same issues as some of the major metro areas like Denver and Aurora with suspects listening in. Routt County only has about 25,000 residents. “I don’t believe we feel right now that there is a necessity for us,” Christensen said. Beyond the need, there’s also the technical aspects. One of the reasons law enforcement agencies are only now choosing to encrypt their radio traffic is because it’s more affordable. In the past, encryption was a tedious and expensive process with the technology those agencies were using. These days, digital radio transmissions are much cheaper and much easier to encrypt if the agency has updated technology. In Steamboat Springs, some of agencies have updated radio equipment but others, like the police cruisers themselves, do not. Beyond that, Steamboat Springs police share radio channels with the Routt County Sheriff’s Office, the Hayden Police Department, state wildlife and parks officers and the National Forest law enforcement officers in the area, among others. If one of these agencies choose to encrypt their communications, all of them have to follow the same path in order to be able to communicate on the same channels. However, if these agencies do eventually end up turning to encryption, Christensen says the burden will be on police to keep the public informed. “If we encrypt our radio channels it’s more important than ever to find a way to be more and more transparent,” Christensen said. While law enforcement agencies move toward encryption, media advocates are worried about the freedom of information implications. “It impedes the ability to do breaking journalism,” said Jill Farscham. Across the country and in Colorado, newsrooms rely on police and fire scanners to follow the latest breaking news and send reporters and photographers to the scene to interview witnesses. “It’s a tool in the toolbox, a primary one, that has been used forever to make sure that there is a timely coverage of that kind of content,” Farscham said. She’s worried public information officers will limit or cherry pick which stories the media finds out about rather than allowing newsrooms to listen for themselves and choose which stories deserve to be investigated. Farscham also has concerns with the agreements some agencies offering media outlets to allow them to access encrypted radio communications. But DPD Chief Pazen insists he would never retaliate against media outlets that criticize DPD, but Farscham believes it’s still a legitimate concern. It would also be up to law enforcement agencies to choose who qualifies as a journalist or media outlet. She also raised doubts about the law enforcement argument that police are facing more dangers with more people having access to scanner traffic online. “You used to have to purchase a scanner and you used to have to spend that money yourself. That economic barrier is removed and somehow that has created an additional vulnerability and I think it’s important to recognize the inherent socio-economic bias in that statement. That perspective suggests that we were safer when only people who had the money to be able to buy scanners could do that,” Farscham said. For Farscham, the bottom line is that there are not enough instances where the information passed over police channels was used for nefarious reasons to justify encryption. For the Colorado Freedom of Information Coalition, encryption means more records requests. Nothing in either of the state’s open records laws require radio communications between agencies to be open to the public. There are ways to get the radio communications or other information after the fact through open records requests, however those requests need to be specific. “First of all, you have to know about it to ask about it and if you don’t know about it because you didn’t hear it on the scanner, you have to find out about it some other way,” said Jeff Roberts, the executive director of the Colorado Freedom of Information Coalition. Even with an open records request, there’s no guarantee that news outlets will be provided with the records or recordings they ask for if it’s deemed to be contrary to public interest. “There’s no time limit also in the Criminal Justice Records Act, so you can make a request and you can wait,” Roberts said. There’s also a cost associated with some records requests for the amount of time it takes to find the records, etc., which can be expensive for new stations that are already struggling to make ends meet. The encrypted radios themselves also cost money, sometimes thousands of dollars. “That, to me, is not a solution,” he said. Beyond that, Roberts pointed out that in some instances news organizations can tell people to stay indoors, avoid areas where a scene is unfolding or to pass out critical safety information. Without scanners, they might not know to do that. “That’s what we’re losing here, is that news value that the public has been getting for years that they might not be getting,” Roberts said. While there are options for media outlets to gain access to some encrypted police channels, amateur radio enthusiasts are being left in the dark. Robert Wareham has liked listening to radio channels ever since he was a kid. Not only does Wareham have scanners in his house, but he also custom equipped his truck with several as well so he can monitor multiple channels at once. For Wareham, it’s about situational awareness and knowing what’s happening in his community. Wareham has a more diverse perspective about radio encryption than most. Not only is he a section emergency coordinator for the Amateur Radio Emergency Service and the vice director of the Rocky Mountain Division of the American Radio Relay League, he’s also a former law enforcement officer. “I was in law enforcement for 20 years in California,” he said. He’s also a lawyer and says there are civil liberties issues at stake when agencies choose to encrypt their radios. Instead of encrypting all of their scanner traffic, Wareham believes adding a delay to online audio streams would protect police tactics. “If law enforcement is concerned that a crook or criminal perpetrating a crime in real-time is going to monitor what they’re doing, introducing a two or three minute delay would make that (scanner traffic) worthless to them,” he said. He believes adding a delay on radio channels is much cheaper and much easier to do than in the past, since radios have gone digital. However, Glidden from Aurora Police says the delay still doesn’t solve the privacy issues. For that, Wareham says agencies need to do a better job training their employees on what information should and should not be conveyed over the radio and to use other ways to pass that information along to one another. With more of these radio communications being encrypted, amateur radio enthusiasts like Wareham are losing their ability to hear law enforcement chatter and are questioning whether encryption really is the right way to strike a balance between safety and the public’s right to know. “Are we going to live in an open and transparent government or are we going to live in a police state?” he asked. At the Colorado State Capitol, lawmakers are considering a bill to limit the amount of encryption law enforcement agencies and other governmental entities are allowed to use. House Bill 19-1235 would require these agencies to keep their radio communications open unless it is a tactical or investigative channel or used to protect the safety of first responders or property. “As a practice, the encryption of dispatch radio communications by state and local governmental entities should be exceptional rather than routine,” the bill reads in part. The bill does allow for agencies to delay the transmission of up to three minutes for online audio streaming to prevent would-be criminals from listening in on police activity in real time. If there is a situation where there is an immediate threat to human life or public safety, the bill allows for agencies to shut off the online audio stream for up to four hours and record the audio instead. Another, even stricter version of the bill last year failed to pass the legislature. Until there’s a law limiting the use of encryption for governmental agencies, though, it will be up to those entities to find the balance between safety and transparency.